War is coming; here’s Article Six of our Countdown to All Out War. Welcome to day six of the JustUs Geeks War Report countdown to All Out War. With only four more days to go until issue 115, the tension is building. I know that I can barely contain myself due to anticipation. Today, in our countdown, we are going to focus on the Hilltop Colony. 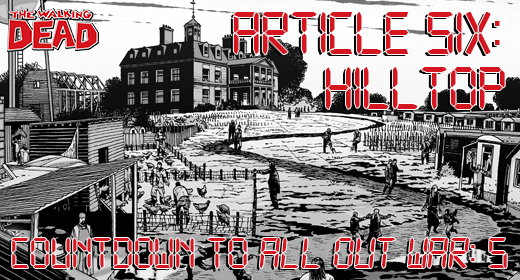 Sadly, since its introduction in issue 94 we have not learned very much about the Hilltop Colony. What we do know, shows that it is probably the weakest of the communities embroiled in conflict with Negan and the most under protected. Their leader, Gregory, is unwilling to get directly involved with the conflict due to his cowardice and avarice. Despite not having active weapons and having a coward of a leader, somehow the Hilltop Colony has become the largest survivor community in the known The Walking Dead universe. When Jesus was first introduced in issue 92, he was an ambassador for the Hilltop Colony, hoping to set up a trade arrangement with Rick and the Alexandria Safe-Zone. Due to their inability to protect themselves, these sort of trade arrangements are not uncommon for the Hilltop. I am sure that their lack of weapons also made them quite an easy target for Negan. Now with war on the horizon, I cannot help but wonder how they will protect themselves if they end up on the wrong side of Negan’s wrath. Jesus recruited quite a number of people from the Hilltop to be a part of Rick’s Army, so what happens when Negan or one of his Saviors recognize someone from Hilltop, and decide to attack them because they are weak? I do not think that war is going to have a happy outcome for this poor undefended community. The leader of the Hilltop is a cowardly man named Gregory. Since his introduction Gregory has done nothing but act in a way that would keep him safest. When faced with the idea of having Rick take Negan down, he agreed, until later when it appeared to him that Rick would not be able to overthrow Negan. Gregory is the kind of leader that will ally with whoever is winning at the moment. Regardless of this, at some point I feel Negan will force him into action, because Negan will not take kindly to Hilltop getting involved in the war. If Gregory decides to not take action, which is likely, he not only will be risking his own life, but also those of everyone in his community. Despite not being armed and their cowardly leader, the Hilltop Colony is extremely large. Their sheer manpower has made them an ideal ally for Rick, but the question of how they grew so large remains. Due to the number of people there, Hilltop could easily be a deciding factor in the war. While Jesus has already recruited a good number for Rick’s Army, if Negan were to arm to the rest and have them fight for him, it could easily shift the war in Negan’s favor. Likewise, if Rick could somehow convince Gregory to mobilize his people against Negan, Rick’s army would be huge. Hilltop will likely play a large role in the upcoming war, no matter Gregory’s isolationist stance. Negan does not take kindly to treacherous behavior (as shown when he killed Spencer for plotting against Rick), and he could view Jesus’s recruitment of Hilltop fighters as just that. If Negan puts Hilltop in his crosshairs, it will mean danger for Maggie and Sophia, who no reside there. Rick will not take kindly to Negan putting two of his longest surviving community members in danger, meaning the war could easily spill directly onto the streets of the Hilltop.